Yoga can also be defined as steadiness of the mind or perfection in life. Yoga is a group of physical, mental, and spiritual practices or disciplines which originated in ancient India. There is a broad variety of yoga schools, practices, and goals in Hinduism, Buddhism, and Jainism. Jnana Yoga (intellectual approach): Listening to the scriptures, contemplating on the true and deep meaning of those scriptures and meditating on that very essence (Brahman) of the scriptures are the three classical practices of Jnana Yoga. Raja Yoga (mastery of the mind): It is the Royal Path of controlling the thought waves, which leads one to self-realization, or Samadhi. According to the great sage Patanjali Maharshi (Raja Yoga Sutras, 200 BC), regulating the thought waves leads to steadiness of the mind/Samadhi, which is the final stage of spiritual discipline. Raja Yoga is also called Ashtanga Yoga because of its eight ‘limbs’ or steps, which are Yama, Niyama, Asana, Pranayama, Pratyahara, Dharana, Dhyana and Samadhi. Bhakti Yoga (the path of love and devotion): Practice of pure Bhakti (devotion) melts away the individual ego and brings God-realization. Bhakti Yoga is suitable for any temperament, but it is especially good for those with an emotional nature. Karma Yoga (the path of selfless action): In Karma Yoga one dedicates himself/ herself to the universe. All actions are done whole-heartedly and without expectation of the fruit/reward of the action. Hatha Yoga is the practical aspect of Raja Yoga. The five methods used in Hatha Yoga to attain perfection of body and mind are practice of Asanas (postures), Pranayama (breathing exercises), Kriyas (cleansing techniques), Bandhas (energy locks) and Mudras (certain postures or gestures). Yoga has proved effective for relaxation, to reduce stress and improve some medical conditions. Many studies have tried to determine the effectiveness of yoga as a remedy for cancer, schizophrenia, asthma, and heart disease. 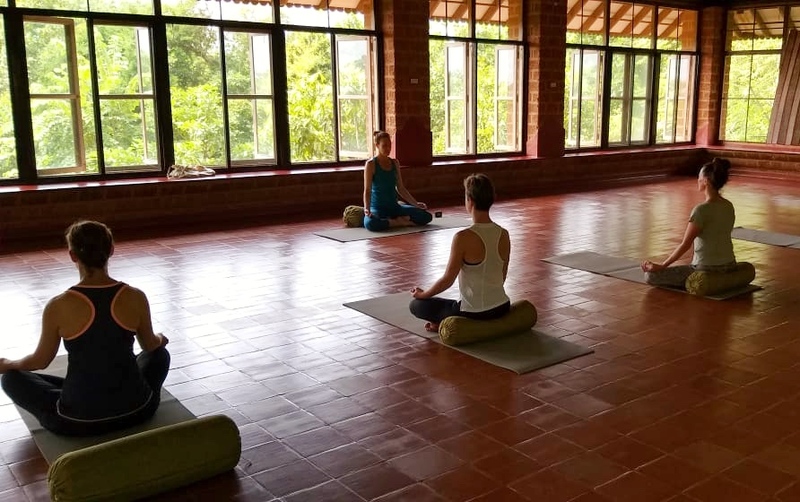 Says Annie Wyatt of Namaste Retreats India: "As a 'low-impact activity' Yoga can actually provide the same benefits as any well-designed exercise programme, increasing general health and stamina, reducing stress, and to strengthen and balance all parts of the body. I teach yogic cleansing techniques as part of our transformational, detox and cleansing retreats. Along with raw juices or an Ayurvedic diet, these really clean up the body and the mind, flush out the toxins and reset a person's health completely in a short space of time." Four years ago June 21 was proclaimed as the International Day of Yoga and is being celebrated by millions of Yoga practitioners – yogis and yoginis - worldwide. On December 1, 2016, Yoga was even listed by UNESCO as an intangible cultural heritage. Join us on a retreat to practice Yoga under the expert guidance of Annie Wyatt and Veechi Shahi in India this September or October. More on our website and social media pages.